Slow Cooker Lighter French Onion Soup is an easy, healthy, tasty soup that’s made in the slow cooker! 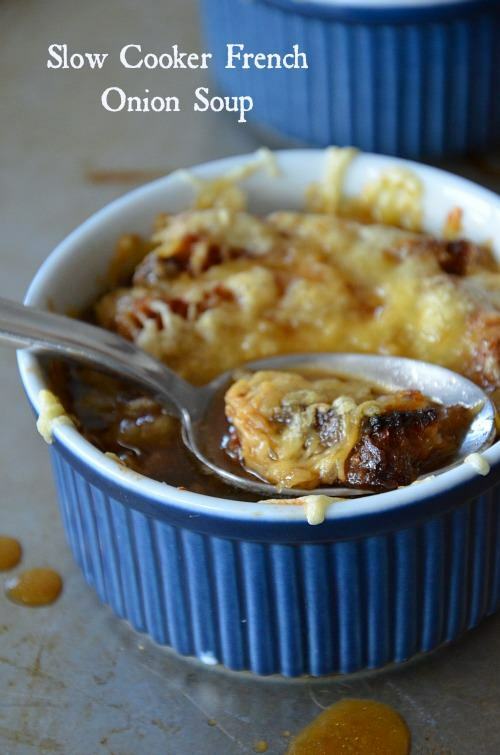 This French Onion Soup from Mountain Mama Cooks sounds delicious! Click here to see The Best Instant Pot Soup Recipes! Click here to see The Top Ten Cook-All-Day Slow Cooker Soups! For Friday Favorites we spotlight past recipes that you may have missed, and this Slow Cooker Lighter French Onion Soup from my friend Kelley at Mountain Mama Cooks sounds perfect for this time of year. During college I worked at a now-closed Salt Lake City restaurant called Le Parisien, and I still have happy memories of the French onion soup there, something I ate pretty much every time I worked! This Slow Cooker Lighter French Onion Soup from Mountain Mama Cooks starts out by caramelizing the onions right in the slow cooker. The soup cooks all day on low and when you’re ready to eat, you dish the soup into individual bowls and melt the cheese under the broiler. Kelly lightens up the soup by using a moderate amount of butter and cheese, but this soup sounds like there’s still plenty of flavor. Get the complete recipe for Slow Cooker Lighter French Onion Soup from Mountain Mama Cooks. I can't wait to try this. I love French onion soup! Kelley, my pleasure. I love the sound of this. Shirley doesn't it look good! I recently had lunch with two of my sisters in a very nice restaurant in SLC. They both had French Onion Soup and of course I was trying to diet and had a salad. When the soup came I regretted so much not ordering it, so maybe I need to make my own! I’m not sure what may have gone wrong with this recipe. For the first two hours I tried to caramelize the onions to a golden brown with the lid on the slow cooker and all I got was soft onions and onion juice. Then I thought maybe I should have had the lid off, so for another two and a half hours I had the lid off. No difference. I gave up and just added the broth and other ingredients. Not sure how you can caramelize and make onions golden in a slow cooker. Barbara, I know that some slow cookers get much hotter than others. But sorry this did not work out for you. Maybe click through to Mountain Mama Cooks and ask the blogger who created the recipe. She might be able to clarify more about how she made it work.